Culture Bore: Chicago, Make Some Noise for [Insert Name Here]! 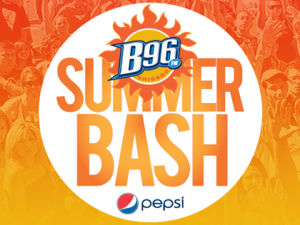 When I look at the line-up of the 2012 edition of the B96 Pepsi Summer Bash, I wonder what it has to offer the pop music fan in 2012. Scheduled performers Gym Class Heros, Karmin, Dev, Havana Brown and The Wanted have all already played Clear Channel's rival 103.5 KISS FM Fantabuloso music festival in May (itself sponsored by PepsiCo subsidiary Mountain Dew). And on the same day as this year's Summer Bash is the first day of Soldier's Field's Spring Awakening (co-sponsored by Red Bull). With co-headliners Afrojack (who has produced tracks for last year's Summer Bash headliners Chris Brown and Pitbull) and Skrillex, along with dozens of other DJ/producers, the event will most likely showcase what last year's B96 Pepsi Summer Bash only hinted towards: people like hearing songs in large groups, regardless of whether the performer is actually around to play it.